On 3 September 1973, Philadelphia Atoms goalkeeper Bob Rigby became the first football player to be featured on the cover of Sports Illustrated. The cover celebrated Philadelphia's victory over the Dallas Tornados in the NASL championship game on August 25. The Atoms had joined the NASL as an expansion team earlier that year, making them the first American sports team to win a title in their first season. 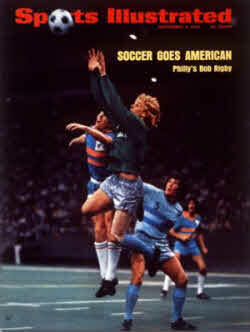 Rigby, who had been taken as the first pick in the 1973 draft by Atoms manager Al Miller, was an integral part of that success, setting an NASL record average of 0.62 goals allowed per game by a rookie keeper. Philadelphia, who started six Americans, won the title match 2-0, with an own goal from Dallas defender John Best and a late header from Atoms back Bill Straub. After the win, Sports Illustrated put Rigby on the cover, with the declaration "Soccer Goes American." Inside, the magazine predicted continued successes based on American players, but the Atoms failed to qualify for the playoffs again and dissolved in 1976. Rigby left the Atoms in 1976 for the Cosmos, starting a journey that would take him to seven other clubs before his retirement in 1985.